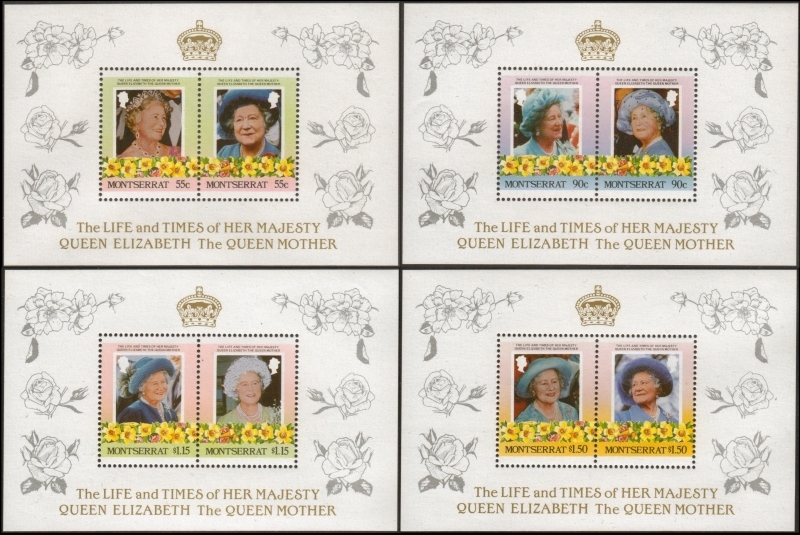 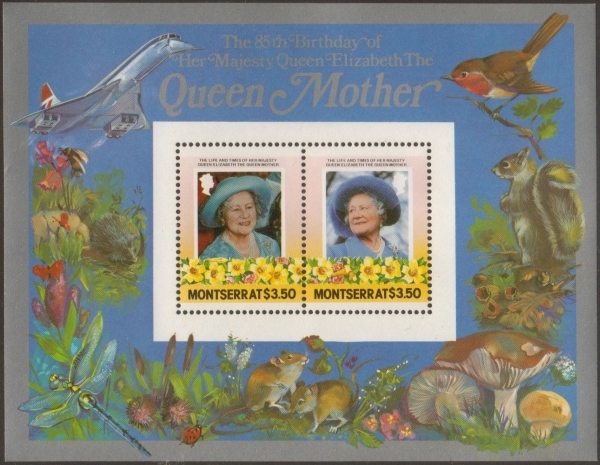 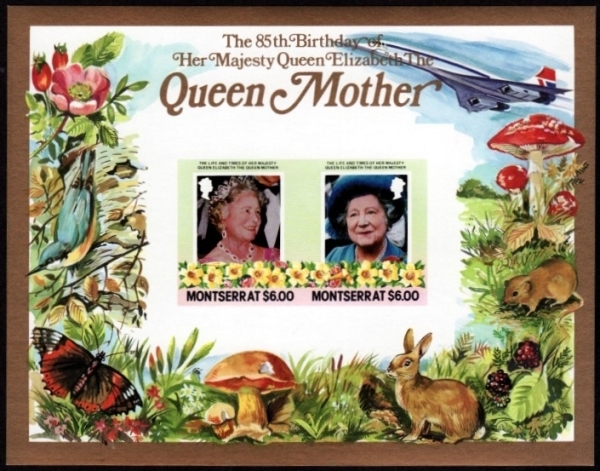 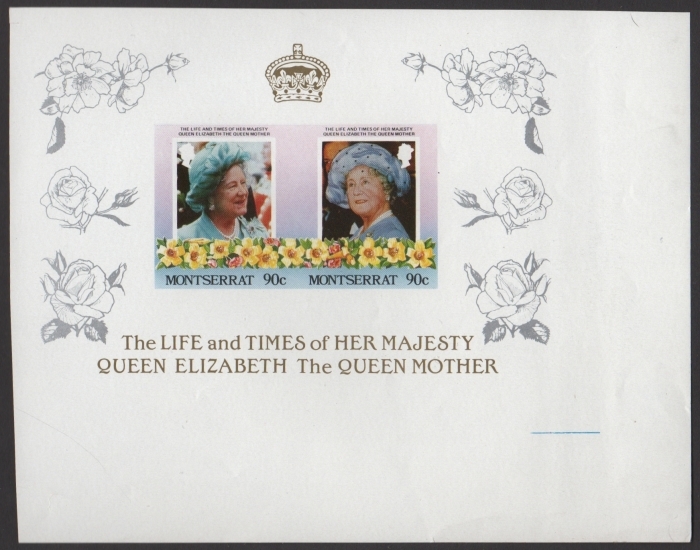 The 1985 85th Birthday of Queen Elizabeth the Queen Mother stamps issued for Montserrat are a beautiful set and very colorful. 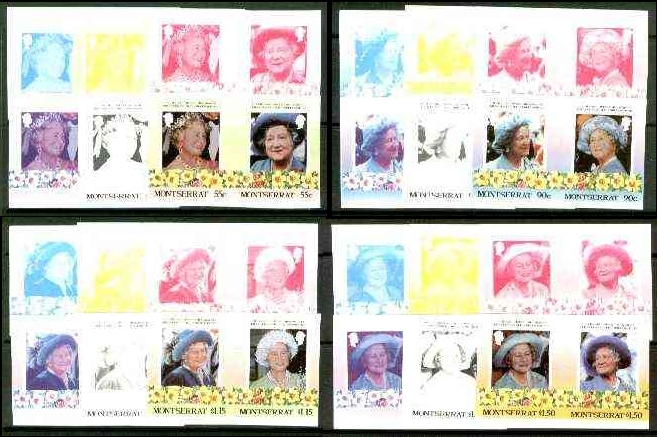 With the souvenir sheets section I will be tallying up both for the one issued in 1985 and the restricted printing set issued in early 1986. 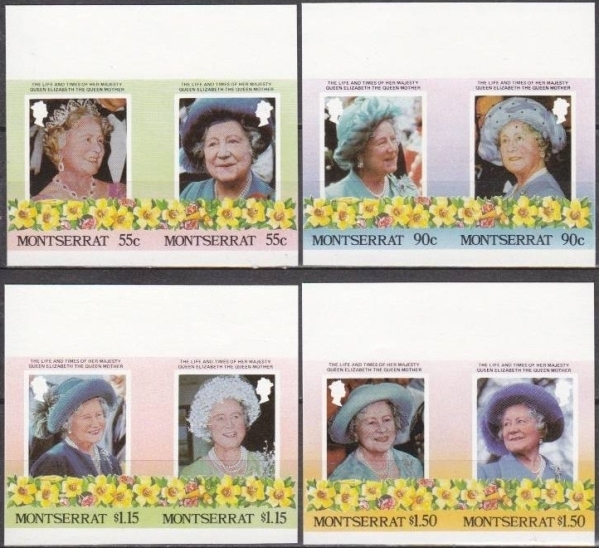 For Montserrat progressive color proofs were retained including the first souvenir sheet! 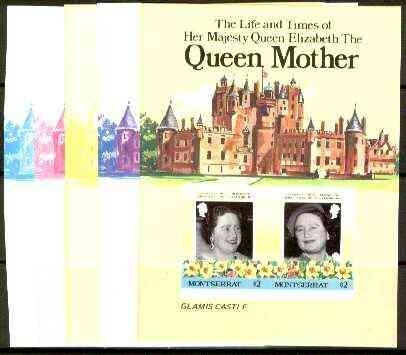 There appears to be no presentation folders for this set. 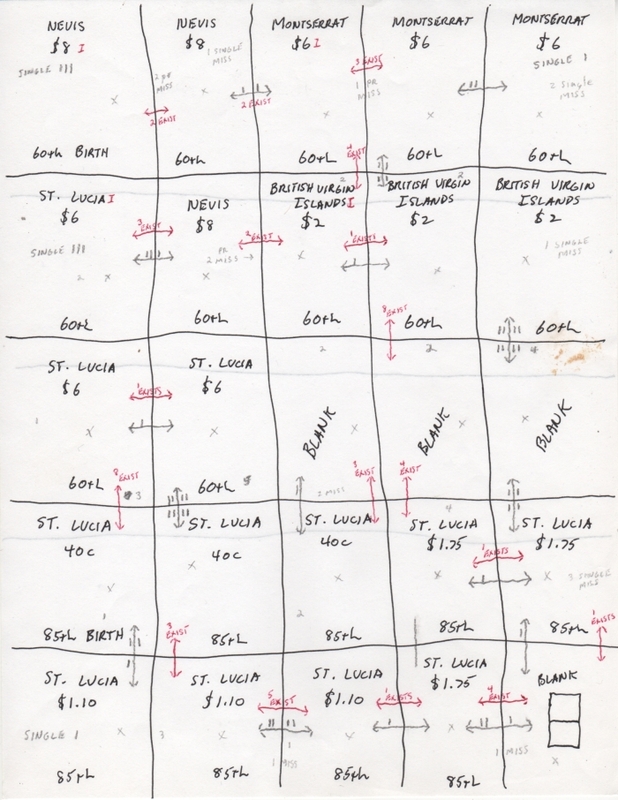 All values exist as imaged. 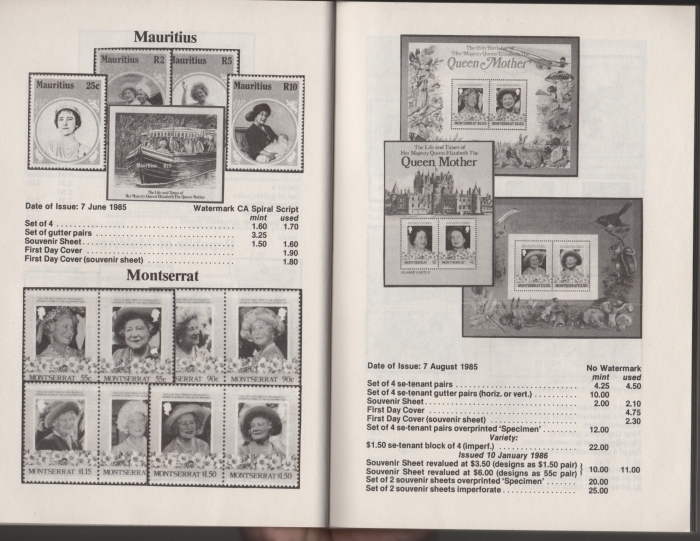 Pricing for each value set should be at $10-15.00. 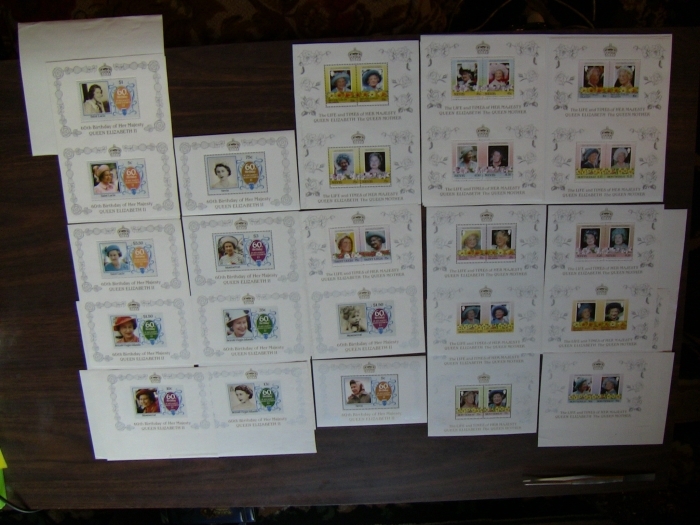 The set of progressive color proofs is available on the market for this souvenir sheet showing they have been retained. 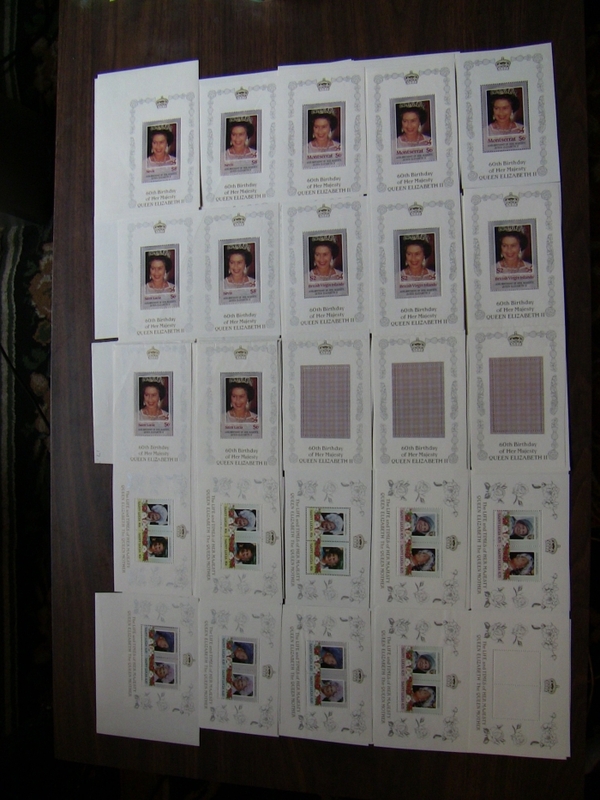 Until quantities are documented on the progressives standard pricing if all are retained should be $25-35.00 a set as imaged. 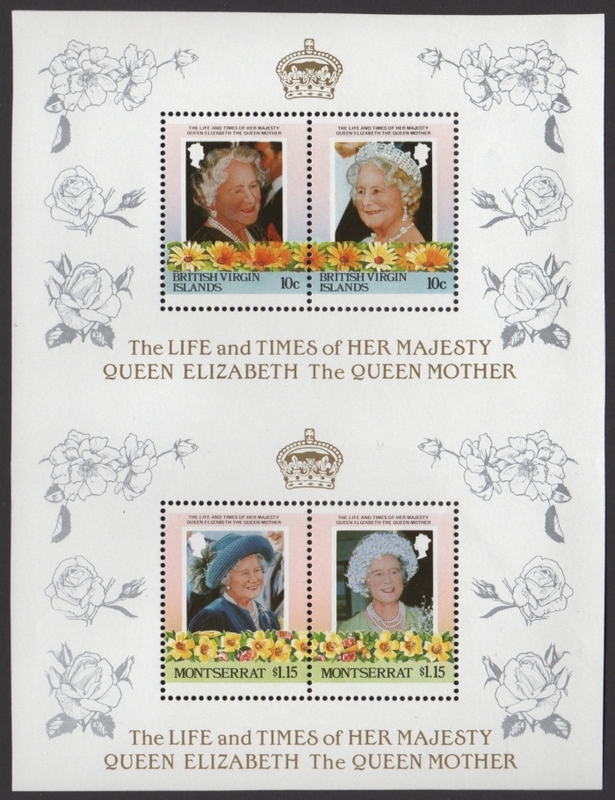 At this time I cannot find the $6.00 value available but suspect because the imperforate versions are, it will show soon. 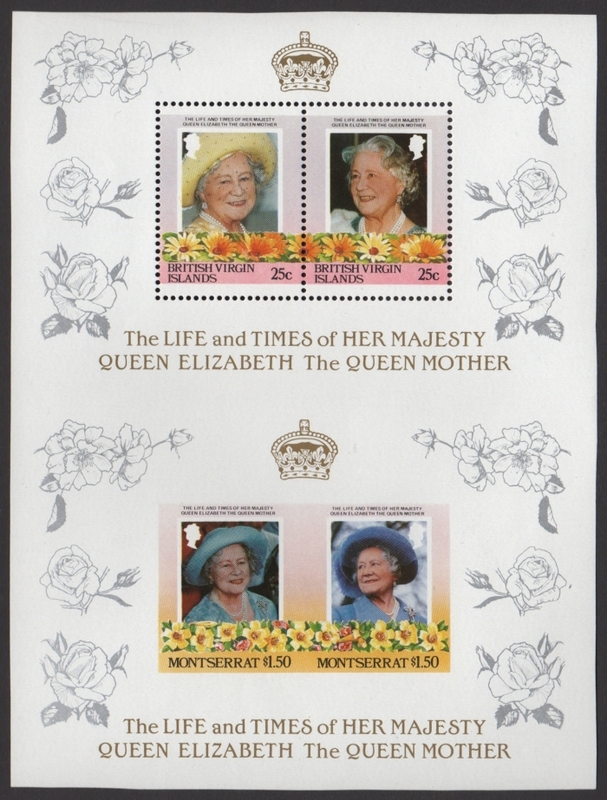 This "error" is found on both the values of the restricted printing souvenir sheets for Saint Lucia. 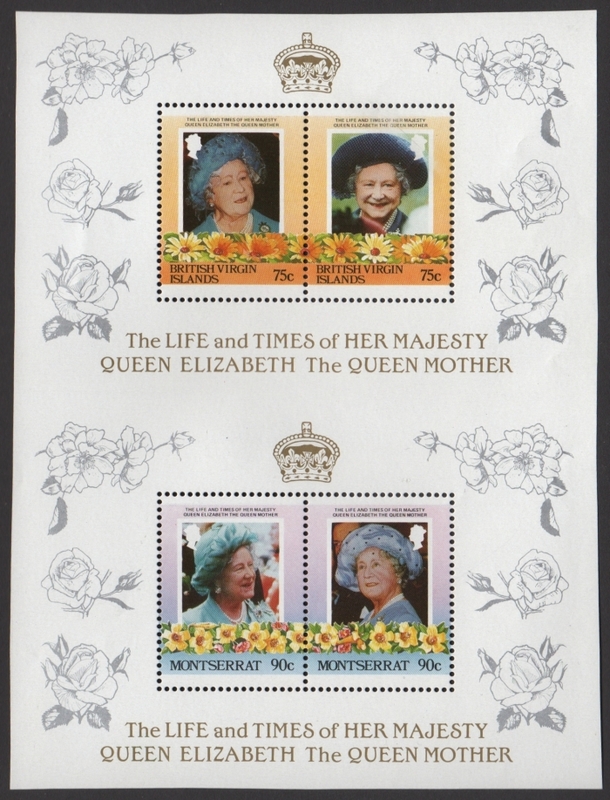 Standard practices of the printer were to produce 3,000 sets of missing color errors. 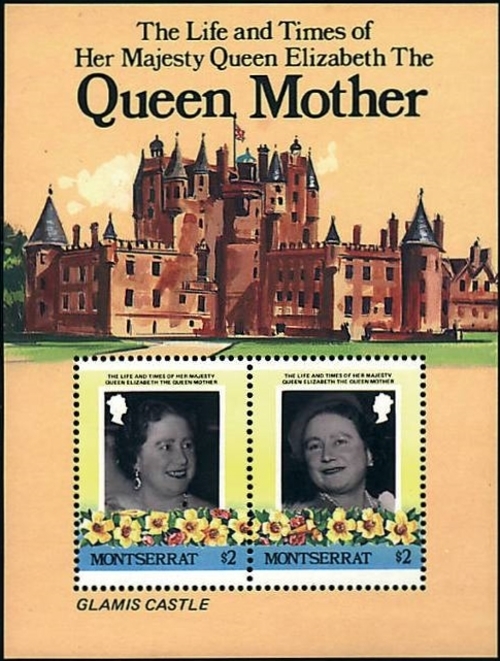 I believe this to also hold true for this type of error. 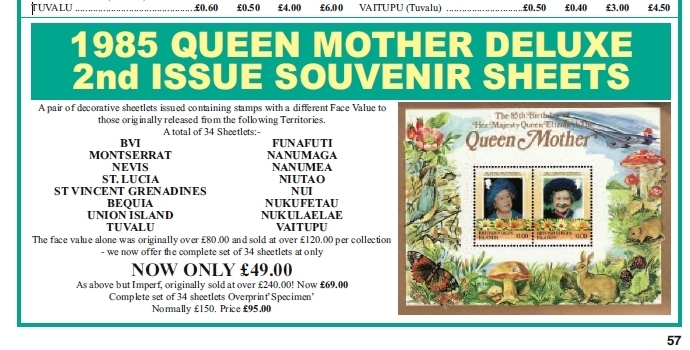 It is sold quite commonly on the market showing they have been retained. 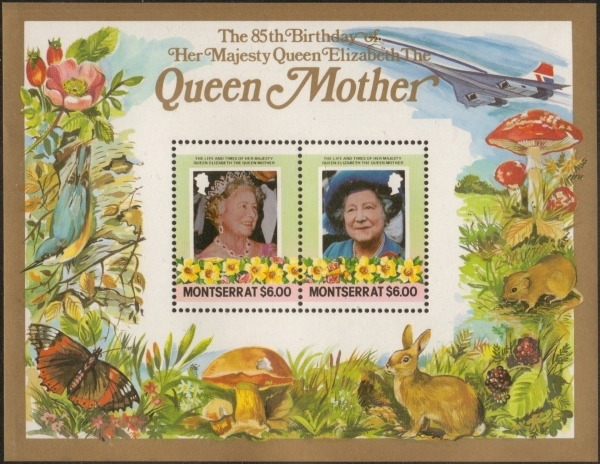 This basically sums up the stamp varieties for the Montserrat 1985 85th Birthday of Queen Elizabeth the Queen Mother souvenir sheets. 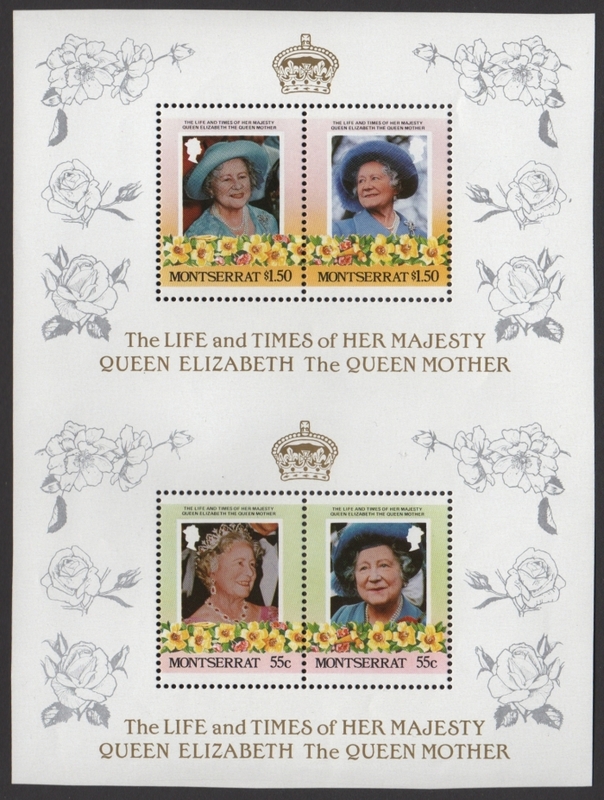 As new information and evidence is found it will be added to this page. Pricing should therefore be around $10-15.00 for a set of the Montserrat version. 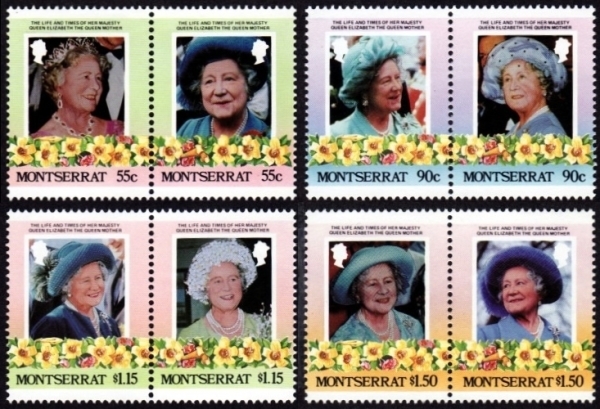 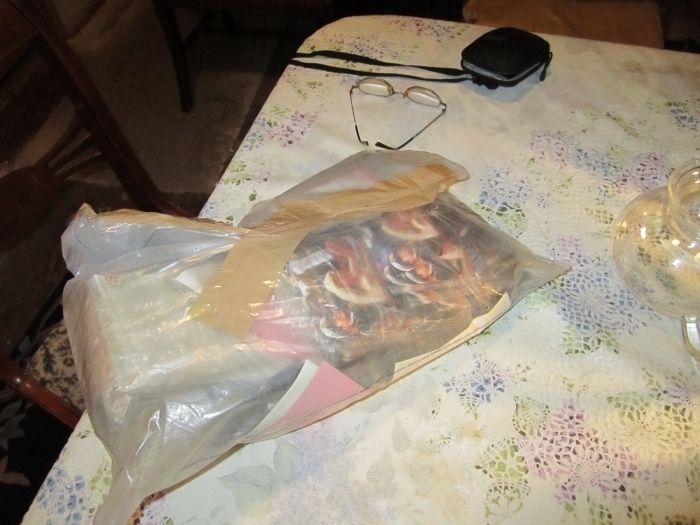 Below are images of the combinations I have for the Montserrat 85th Birthday. 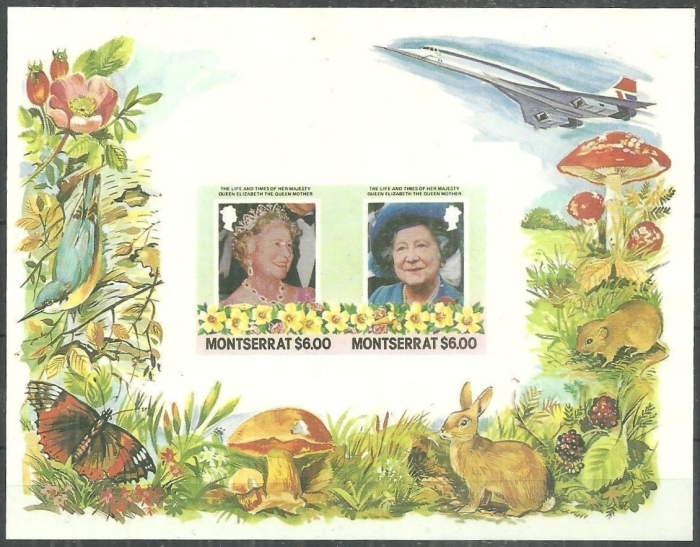 Noting there were no Montserrat 85th Birthday unissued souvenir sheets on the second composite sheet. 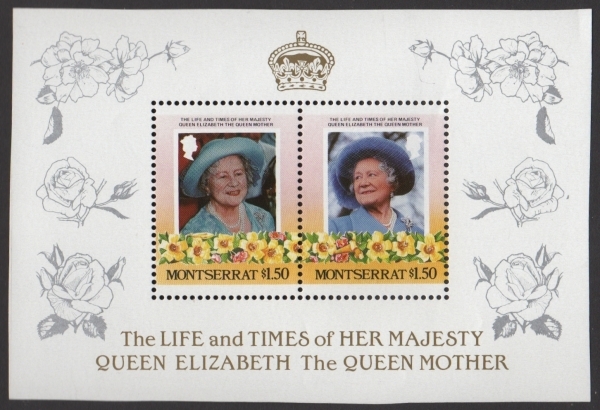 This basically sums up the stamp varieties for the Montserrat 1985 85th Birthday of Queen Elizabeth the Queen Mother Omnibus series. 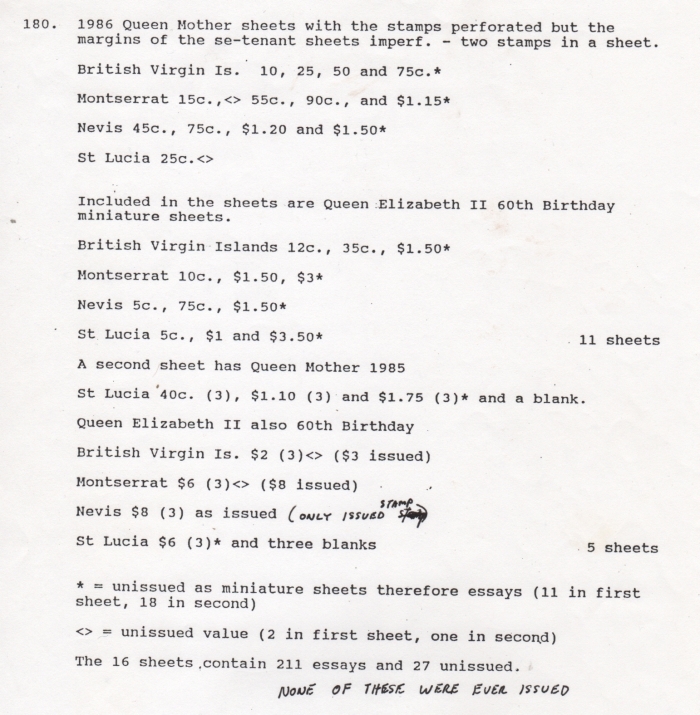 As new information and evidence is found it will be added to this page.